What a day! 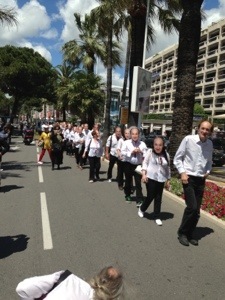 The march of the 100 Otway’s up the Croisette in Cannes and around the town before the screening of Otway The Movie at the Cannes Film Festival, was an unprecedented success. 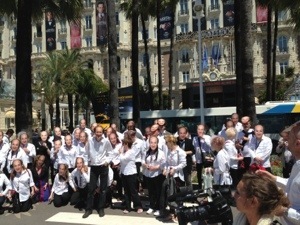 At least 100 people, mostly dressed in John Otway’s trademark stage garb of black trousers and white shirt, and wearing truly scary Otway masks, paraded around Cannes at midday yesterday before descending on the cinema for the international première I have so many pictures it was so hard to choose one for today’s missive that I have broken with tradition and include 2 today. At one stage I counted 50 professional cameras and 3 TV cameras trained on the motley procession, at one stage encountering the official slightly bewildered Miss France who graciously allowed Otway a photo opportunity by donning one of his masks for the press. It has started with a couple of pints of Guinness at Ma Nolans, the new Irish bar in the centre of Cannes, just off the Route d’Antibes. The mystified staff, well used, one would think, to publicity stunts during the Festival, seemed bemused by loads if people wearing the masks whilst ordering drinks. With the première over, it was time to retire for a final drink before leaving Otway to soak up the post screening atmosphere, sign some more autographs and pose for one more evening for the press in front of his fans, and return for an early supper at the Cafe Des Arcades in Valbonne with the voluptuous Jude “where’s my Baileys” and John “800 years of repression” O Sullivan, the corpulent and cuddly Peachy Butterfield accompanied by the willowy and impossibly beautiful Suzanne, and later joined by Mr Clipboard. When it came to paying the bill, one gargantuan man from our party entered the wrong PIN number into the restaurants machine, prompting me to suggest to the waiter that perhaps he should prepare “les gaunts plastique” (rubber gloves) the suggestion being that, should he be unable to pay, he could work off the debt by doing the washing up. Once Mr Clipboard had heard the reference to rubber gloves, that old public schoolboy humour could not be suppressed and he loudly suggested alternative usages for them, and Jude then suggested that they could be used for intimate searches. Yes, it was time to leave. Tradition dictates that we had to adjourned thereafter to the pav, our Thai style party pavilion, for a night cap. Regular readers will know that this is a slippery slope, as one is never enough, and so it transpired. Thus the planned early night, an obvious necessity given what will occur today, did not come to pass. Today is the birthday of That Nice Lady Decorator and we are sailing from Port de la Rague at Mandelieu to St Tropez for a late lunch. Given that it is a bank holiday in France, and being sandwiched between the Cannes Film Festival and the forthcoming Monte Carlo Grand Prix, there is a fair chance that the restaurant will be packed with celebrities, so arriving aboard one’s private yacht and being collected by the restaurants tender, is always a nice way to make an entrance, however I will resist the temptation to wear my Otway mask on this occasion. I find myself desperately disappointed by your apostrophe work in the very first line. I thought you better than that and now have to kill you I’m afraid. Please let’s not get into your punctuation, grammar and spelling or we could be here for months ! Glad you’re having fun and happy birthday to Issy. Did you know that Happy Birthday has received the greatest amount of Royalty payment in the history of popular music ? Something like 25 million pounds I believe. When do we find out that Otway has won?